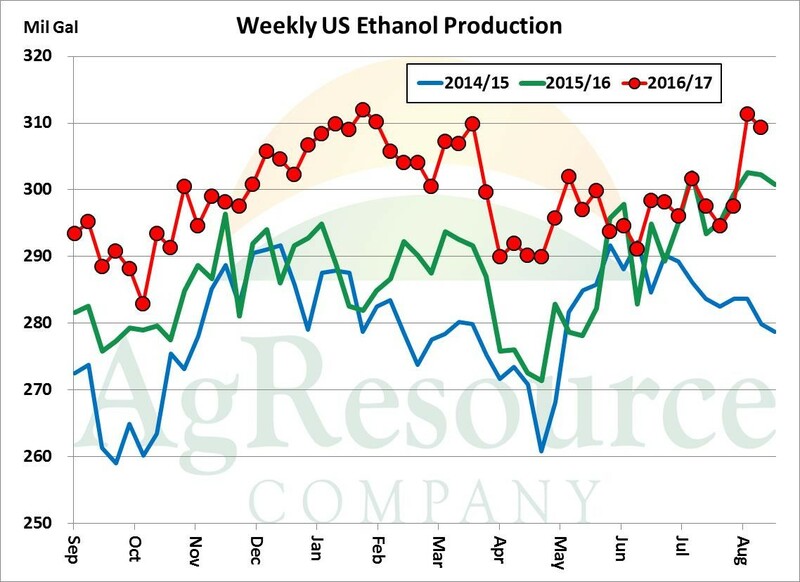 US ethanol plants through the week ending August 18th produced 309.3 million gallons of ethanol, down slightly on the previous week (which was near record high) but well above the same week in 2016. 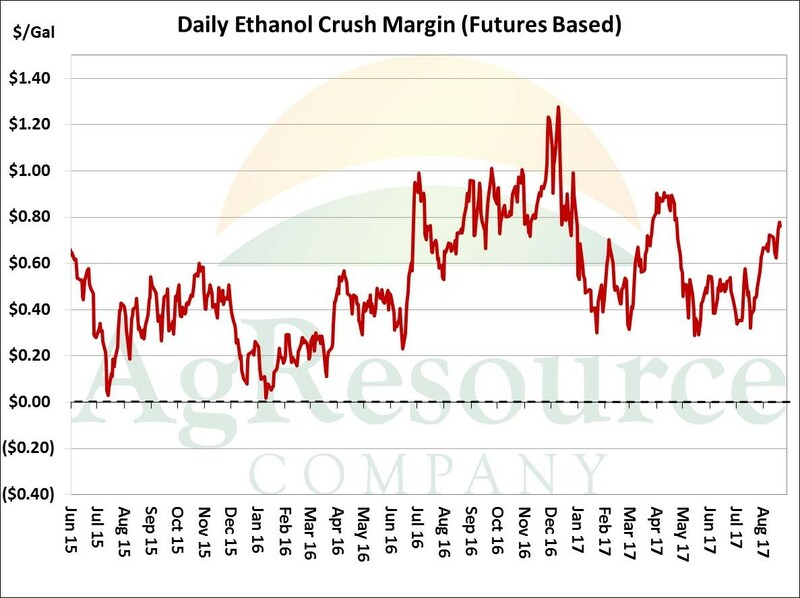 It’s apparent that US ethanol plants have responded to the recent surge in production margins, which in just a few weeks have rallied from $.30/Gal to just over $.75/Gal. There’s talk within the industry that, in spite of rather ho-hum gasoline consumption, plants aim to expand capacity, perhaps substantially, over the next year and there is indeed incentive to do so. Whether this makes fundamental sense longer term will in large part hinge upon gasoline demand, and to a lesser extent US ethanol exports. Certainly, the USDA will not lower corn consumption in its next several reports. And, importantly, there’s no sign that export demand is slowing. Weekly residual use last week totaled 44 million gallons, vs. 1-12 million in the previous two weeks, and the pace of residual disappearance remains record large. Brazilian cash ethanol prices are moving higher, and so are Brazilian premiums to US origin. ARC expects further boosts in residual (which is the best indicator of export demand) into late year. 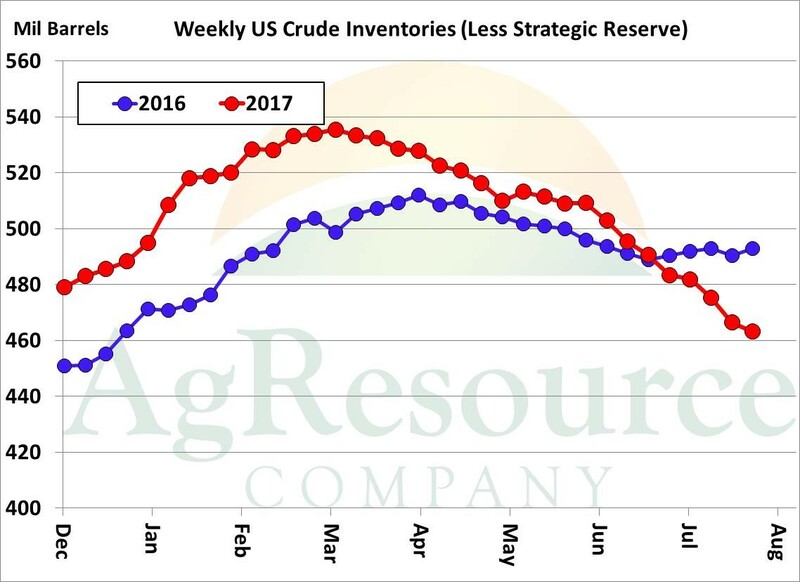 US crude stocks also continue to erode, and as of last week totaled 463.2 million barrels, the lowest since early 2016 and down some 6% from this week in 2016. As supplies are drawn down, spot crude futures have found support above $45/barrel, and are expected to exist in a range of $45-52/barrel into autumn. 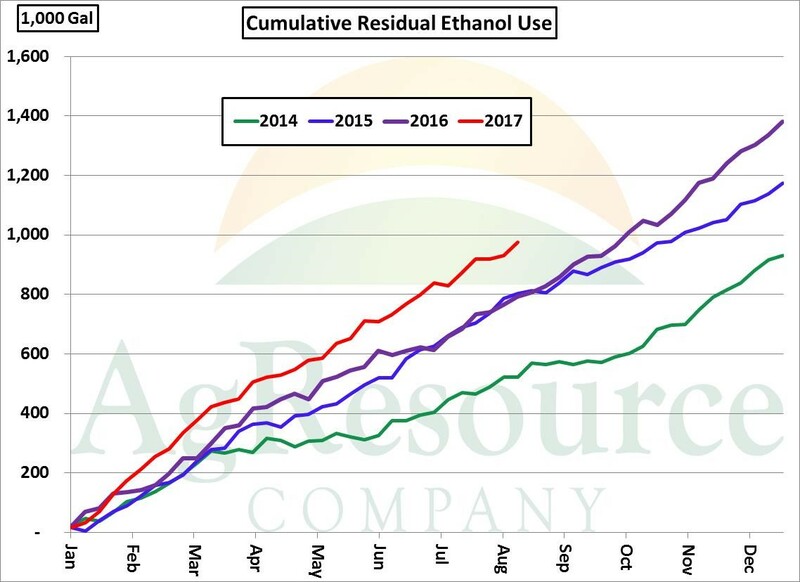 As such, biofuel margins will stay elevated, and ethanol’s draw on corn supplies will stay record large. Amid plant capacity expansion, ethanol’s corn demand draw could reach 5,600-5,700 Mil Bu by 2018/19.